Type 1 tank agitator with 60:1 gear reduction for 29 RPM. 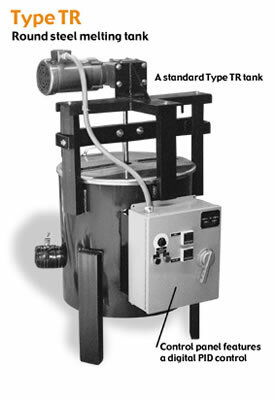 Melting tank agitation speeds up melting time, distributes heat more evenly and keeps inert material fillers in suspension. Order agitation in either air driven motors or electric gear motors. Speed control and grates are available for our agitators.